The House speaker is meeting with senior officials in the new administration to review his tax reform plans. President-elect Donald Trump and House Speaker Paul Ryan are getting ready to tackle one of Ryan's signature issues: reforming the U.S. tax code. According to The Washington Post, Ryan will meet with the president-elect's team Monday night to discuss the tax reform ideas in his "A Better Way" proposal. A senior Republican aide told CNN, "The purpose of tonight's meeting is to walk through the tax reform plan House Republicans put forward last year in our 'Better Way' agenda. ... This is a priority issue for the incoming administration and the House, and [House Committee on Ways and Means Chairman Kevin] Brady will lead those efforts for us this year." Trump himself won't be in attendance, but incoming White House officials including Steve Bannon, Reince Priebus, Jared Kushner and Stephen Miller will be present, according to the Post's sources. Trump's new National Economic Council director Gary Cohn, formerly the president of Goldman Sachs, will also be attending the meeting. 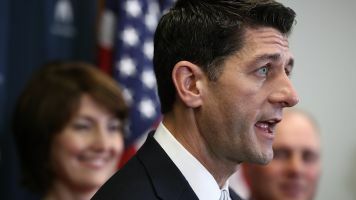 Ryan's "A Better Way" plan outlines new legislation on a number of issues the Speaker hopes to push through the House. He'll have a better opportunity to focus on that agenda now that Republicans control the White House and both chambers of Congress. Ryan and Trump see eye to eye on many tax issues. For example, both have argued for simplifying the current tax bracket structure and eliminating the estate tax. But Ryan will have to square his tax policy proposals with Trump's repeated campaign promise to slap heavy tariffs on goods manufactured in other countries — something Ryan has flatly rejected.